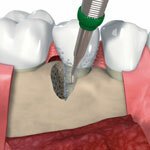 Periodontal Regenerative Surgery has been developed over decades and is still on the cutting edge of research. 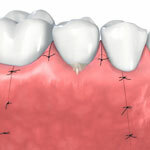 The ideal method of treating periodontal disease includes regenerating the structures destroyed by the disease process. 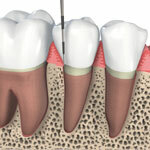 When periodontal disease attacks the gums around the tooth, it is actually effecting the surround bone, ligament, gum tissue and the root surface of the tooth. Regeration surgery aims to regrow this lost tissue with the aid of biological materials which include engineered stem cells, growth factors, and bone grafting materials. 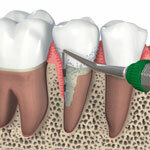 There are various forms of periodontal regeneration surgery and when indicated they can predictably improve an area that has been destroyed by gum disease. 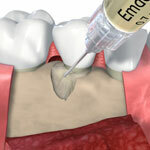 Below is a brief overview of a form of periodontal regeneration surgery which utilizes enamel matrix derivatives (Emdogain). A localized severe periodontal pocket is carefully cleaned out and a regenerative agent (Emdogain) is placed in the defect area. The surgical site is closed and allowed to heal for 6-9 months to allow the surround structures to regenerate.